Kementerian Koordinator Bidang Perekonomian Republik Indonesia - Kemenko Perekonomian or commonly known as "EKON" is the Coordinating Ministry for the Economics Affairs of the Republic of Indonesia. Kemenko Perekonomian is one among 4 coordinating ministries in the Indonesian Working Cabinet (Kabinet Kerja) in charge of planning and policy co-ordination, as well as synchronization of policies in the fields of economics. Kemenko Perekonomian is under and responsible directly to the President of Indonesia. In the Working Cabinet (Kabinet Kerja lead by the President Joko "Jokowi" Widodo, Kemenko Perekonomian is supervise 10 ministries for the economy, which include the Ministry of Finance, the Ministry of Commerce, the Ministry of State Owned Enterprises, the Ministry of Cooperatives and Small Medium Enterprises, the Ministry of Industry, the Ministry of Agriculture, the Ministry of Labor, the Ministry of Public Works and Public Housing, the Ministry of Environment and Forestry, and the Ministry of Agrarian and Spatial. 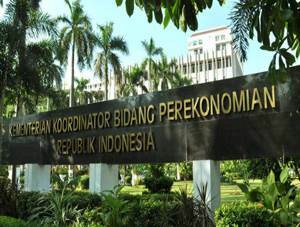 According to information found in the Ministry's website as cited by JobsCDC.com, the organizational structure of Kemenko Perekonomian is organized as 7 deputies, 1 inspectorates, 1 secretariat, and 7 expert staff. Kemenko Perekonomian is led by a Coordinating Minister for Economics Affairs, who is Darmin Nasution. Darmin Nasution - former of governor the central bank of Indonesia - was sworn as the Coordinating Minister for Economics Affairs by the President Jokowi on 12 August 2015 to replace Sofyan Djalil. Kemenko Perekonomian is based in Jakarta and its head office is registered at AA Maramis Building - Jl Lapangan Banteng Timur No 2-4 Jakarta Pusat 10710. Minimum Bachelor of Economics / Economics and Development Studies from State University or Private University with study program accredited A. Male / Female with maximum age of 28 years old. Able to operate computer MS Office. Have competence in professional communication. Have solid understanding about the administration system. Good English skills with a minimum TOEFL score of 600. Have the ability to analyze economic data. Have the ability to create reports. Able to work independently or teamwork. Have good work attitude and motivation. Have NPWP and active BPJS Kesehatan (unpaid contributions) or willing to become a member of BPJS Kesehatan and pay contribution if accepted. Male / Female with maximum age of 30 years old. Minimum Bachelor of Communication Science / Information Engineering / Information Systems. Minimum GPA of 3.00 for State University or 3.25 for Private University accredited A (scale 4.00). Have expertise in graphic design and website-based programming. Mastering Corer Draw, Microsoft Office (World, Excel, PowerPoint) and other graphic design applications. Good English skills with a minimum score of 450 (TOEFL), 500 (TOEIC) or 5 (IELTS). Physically and mentally healthy, as evidenced by a health certificate from a Government Doctor. Well-behaved, as evidenced by SKCK. Preferably have experience in Ministries / Government or private Institutions for minimum 1year, evidenced by a Certificate of Work Experience. Male / Female with minimum age of 23 and maximum 30 years old. Minimum Bachelor of Civil Engineering / Environmental Engineering / Water Engineering. Minimum GPA of 3.00 for State University or 3.25 for Private University accredited (scale 4.00). Operating knowledge of Microsoft Office (World, Excel, PowerPoint) and other office applications. Male / Female with minimum age of 21 and maximum 35 years old. Minimum Bachelor of International Relation / Economics Development. Good English skills with a minimum TOEFL ITP score of 500. Male / Female with maximum age of 35 years old. Minimum Bachelor of Regional and City Planning Engineering / Planology. Minimum GPA of 3.00 for State University or Private University accredited A (scale 4.00). Operating knowledge of Microsoft Office application. Not working / professional bound by contract with other agencies or companies. Have a good analytical and communication skills. Minimum Bachelor of Informatics Engineering / Information technology / Information Systems. Minimum GPA of 2.75 for State University or Private University (scale 4.00). Operating knowledge of Computer, Microsoft Office and WebGIS-based programming. Advanced knowledge of manage server service with supporting software. Minimum Bachelor of Remote Sensing / Geography. Operating knowledge of Mapping application (ArcGiS), Microsoft Office or other office applications. Advanced knowledge of management of Geospatial data. Minimum Bachelor of Law / Civil Law / State Administration Law. Minimum GPA of 3.00 for State University or Private University (scale 4.00). Preferably for those who have experience for minimum 1 year. Fresh graduate are welcome to apply. Preferably for those who have good knowledge of strong interest in Law/Regulation related to spatial or spatial arrangement. JobsCDC.com now available on android device. Download now on Google Play here. Please be aware of recruitment fraud. The entire stage of this selection process is free of charge. Kemenko Perekonomian - Non CPNS Technical Support Staff EKON February 2018 will never ask for fees or upfront payments for any purposes during the recruitment process such as transportation and accommodation.